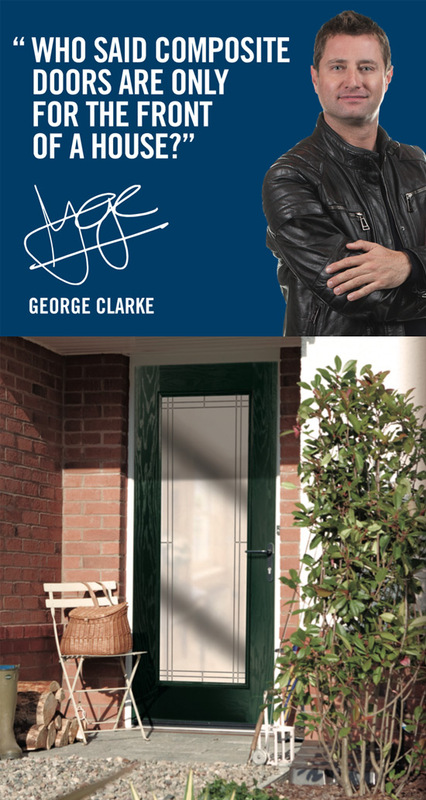 This month George Clarke asks ‘Who said Composite Doors are only for the front of a house’? Hi, I’m George Clarke, product ambassador for Truedor from IG Doors. I believe that Composite Doors are one of the best products on the market today when it comes to quickly and dramatically changing the appearance and the feel of the home, and to making a really personal statement. This month I want to address a myth that has grown up that Composite Doors are only front doors, and ask why people rarely think about them for the rear of their homes? Perhaps it is because we all focus on the front, pointing out the value both aesthetically and technically of a new door as the first impression people get of your home, and of you as an individual. We all focus on the immediate impact a new front door can make to the appearance of the home and the feel good factor that goes with it. The reality is that the vast majority of reasons for buying a composite door for the front are equally relevant when it comes to the rear – and in some cases more so, certainly in the case of security. There is also a feeling that back doors are ‘just’ functional, less used than the front door of a property, and rarely seen by anybody but the homeowner, so the appearance is not important. Why do back doors have to be simple designs with a panel at the bottom and glass at the top, or even more commonly a ‘2xG’ – a phrase so common it has become a part of the common language of the industry? Back doors do not have to be simple styles, they can be as interesting as those you choose to install on the front; the range of styles is as complementary to the back of a home as it is to the front - who said you cannot have a feature door on the rear of the home? It’s time to move on – let’s explore the benefits of a composite door as a product suitable for the rear of the home with the same enthusiasm as we have always done as a product suitable for the front. Let’s bring back doors to the front of our thinking.